Bungie’s third and final livestream for Destiny‘s Age of Triumph event has concluded, having this time focused entirely on giving screen time to the new raid gear, Ornaments and weapons headed to the shooter next week. Vault of Glass, King’s Fall, Crota’s End and even Rise of Iron‘s Wrath of the Machine will all be receiving updated versions of their respective sets, with Ornaments for each aiming to drench them in color and new visual effects. Check out concept art for each set below and see if you can decide which get-up you like the look of the most. Personally, I can’t decide, as they all look fantastic. 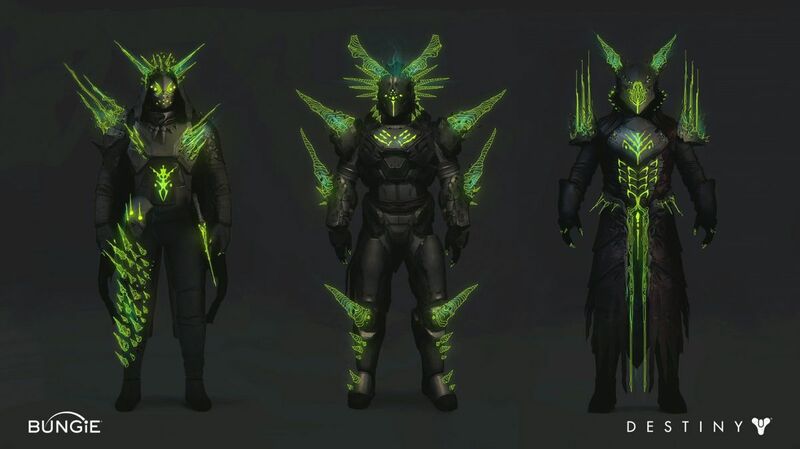 Each of the new gear sets will be made available as part of the update, although as per Bungie’s comments in a previous stream, each rejigged raid will be released on a week by week basis as part of a new playlist, with Crota’s End set to be the first to kick off the cycle. Once all of them have been featured once, players can select them manually, although additional rewards offered through the featured playlist won’t be obtainable. As far as the rest of the sandbox update goes, all weapons originally obtainable from each raid will be brought up to Year 3 standards, although some of those Primaries that originally boasted elemental damage, like the fan favourite hand cannon Fatebringer, will now drop in both Legendary and Exotic forms, the latter of which will retain its elemental bonus. A new batch of Ornaments for Dragon’s Breath, No Land Beyond, Touch of Malice and others were also shown. Finally, a new wave of balance changes will coincide with the update, including tweaks to how much sidearm ammo Guardians spawn with in the Crucible, as well as a slight nerf to hand cannons and a buff to auto rifles. There’s a whole lot more to come, although you’ll have to wait until release day for the full list of patch notes to be made available. Destiny‘s Age of Triumph event begins March 28 at 10 am PST/1 pm EST/5 pm GMT for Xbox One and PlayStation 4. See you then, Guardians.